Desktop is a experimental Firefox addon that allows you to customize the new tab page of Firefox with your bookmarks or your favorite websites. This feature is missing in Firefox but other browsers like Google Chrome and Opera have it, infact Opera has this from long. 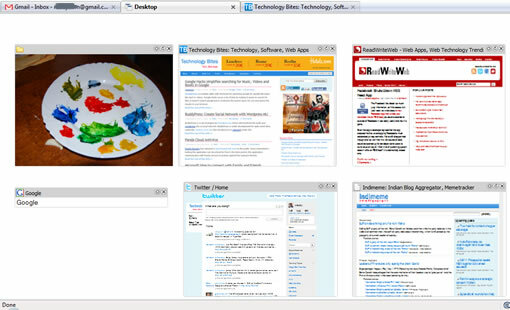 With Desktop you can set web pages as thumbnails in the new tab page and launch them with one click. The extension allows you to customize the way you want, you can drag the thumbnails to increase their size, set a background image for the tab page. When you arrange thumbnails the page shows you a grid structure so you can arrange all your thumbnails at equal sizes for more pleasing look. You can also create sub folders to store number of bookmarks pages as thumbnails, there is one problem though, it won’t allow you to give names to the sub folders. To avoid confusion you can set a background images to the sub folders so that you can remember easily what type of bookmarks are there in that sub folder. After installing Desktop addon right click on the new tab page and add thumbnails or folders. If you select thumbnails you can just enter the URL of any webpage you want to store or select from the drop down list of your bookmarks toolbar bookmarks. You can also add Google search to the new tab page, this may not be very useful because Firefox by default has Google search engine in the search bar. Desktop addon is a experimental addon and is quite useful to store your most visited websites in the tab page to have one click access to them.